Q. My drain/toilet is blocked, what should I do? Firstly you need to check if the drain is blocked with hair or in the case of a toilet, sanitary products. If it is then it is your responsibility to rectify this. With a blocked toilet, you can try flushing it with buckets of water a number of times. With a blocked shower, bath or sink drain, you can purchase drain unblocker from a supermarket or use a plunger. If you have done this and you still have an issue, please send in our maintenance request form. (Please note that if a contractor is sent out and the issue is a fault of the tenant, there may be a charge). Q. All/part of my electrical items have switched off, what should I do? ]If all of your electrics have switch off then please check with neighbouring properties to see if there is a power cut in the area. You will also need to check the fuse box. 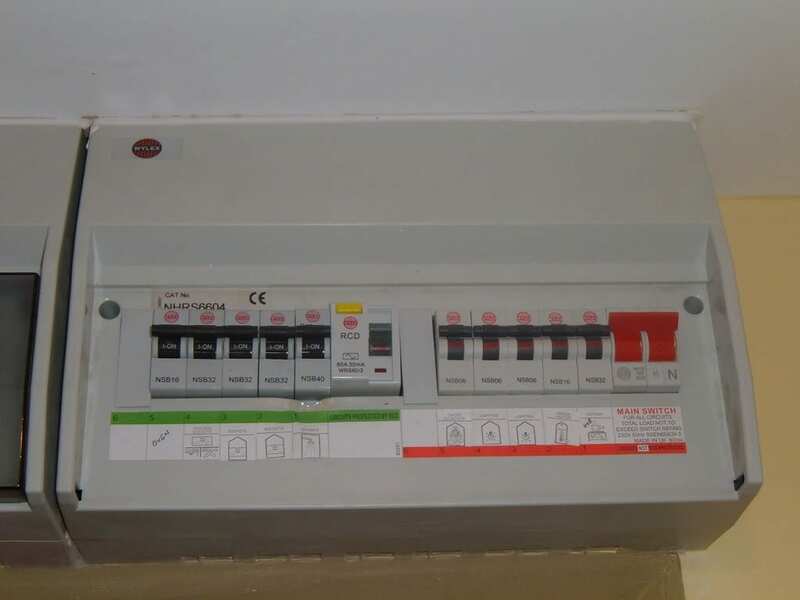 This is a box full of switches that will usually be located above a door or in a cupboard (please see the image below). Once you have located it, please ensure that all switches are facing up. If one is not, then flip it and your issue should be solved. If a switch keeps flipping down again then it is likely to be an appliance causing the issue, please try and figure out which appliance it is and then if the appliance causing the issue is provided by your landlord, please submit a maintenance request form. In the case of an appliance not switching on, it may need switching on at the isolator switch as well as the appliance itself. The isolator switch is usually located on a wall or in a cupboard nearby. If you are unable to locate this then please ask a member of our team who will be able to help. Q.A light bulb has blown/fused, what should I do? If this is a standard bulb on a ceiling below 9 foot in height then you are usually responsible for replacing it yourself. If you are not sure, then please contact a member of our team. Please note that any tenants living in Hub Student, Clyde Court, The Platform and Grace House are responsible for replacing the light bulbs themselves. Q. A water heater/ electric heater will not switch on, what should I do? Please ensure firstly that the heater is switched on at any isolator switches located on a wall nearby and on the heater itself. Try another item in the socket (if possible) to see if the socket or the heater is not working. Please note that if an electric heater has blown a fuse due to drying items on them then there will be a charge if a contractor comes to fix it as this is a fault of the tenant. Q. My vacuum cleaner is not working, what should I do? Please ensure that the vacuum bag has been emptied and placed back inside or in the case of a bag-less vacuum cleaner, it has been emptied as well as the filter being cleaned out. If you are still having issues then please send in a maintenance request form. Q. My washing machine is not draining, what should I do? The filter may be blocked. You are responsible for emptying this yourself if you can get access to it. The filter is usually located behind an access hatch near the front base off the washing machine. You will need to open the hatch, undo the filter cap and pull out the filter assembly then remove fluff and other debris. Ensure that you close everything fully before operating the machine again. Please take care as if you damage anything then you will be charged. If you have any other issues with your washing machine or if you cannot access your filter then please send in a maintenance form. Q. I have a leak, what should I do? The leak needs to be isolated by turning the water supply off at the stopcock until a contractor can attend to the property. If the leak is dripping then place a bucket or other container below to catch the water and avoid further damage to the property. If the leak is coming from an adjacent property then please try to contact the occupants to try and stop the leak. It is also advisable to ventilate the property or switch on the heating to dry up any moisture. Q. My freezer is frozen with too much ice, what should I do? You will need to defrost this yourself by switching off the appliance and placing towels on the floor to soak up the water. Once the ice has melted then you can switch on the appliance and continue using it as normal. This is the tenant’s responsibility to rectify. Q. I have damp, mould or condensation, what should I do? Mould can’t grow without moisture, so tackle wet areas right away. Do not leave wet items lying around the house, and make sure to dry the floor and walls after a shower. Don’t leave wet clothes in the washing machine, where mould can spread quickly. Hang them to dry in areas with good air circulation. Prevent moisture with proper ventilation. It may be that your routine domestic activities are encouraging the growth of mould in your home. Make sure an activity as simple as cooking dinner, taking a shower, or doing a load of laundry doesn’t invite mould by providing proper ventilation in your bathroom, kitchen, bedroom and any other high-moisture area. Your energy-efficient home may be holding moisture inside, so open a window when cooking or washing dishes or showering or run an extractor fan. Improve air flow in your home. As temperatures drop, the air is able to hold less moisture. Without good air flow in your home, that excess moisture may appear on your walls, windows and floors. To increase circulation, open doors between rooms, move furniture away from walls, and open doors to closets that may be colder than the rooms they’re in. Let fresh air in to reduce moisture and keep mould at bay. If a leak occurs, report this to Westmanor Student Living as soon as possible so that we can take the necessary action. Q. My smoke alarm is beeping every few minutes, what should I do? This normally means that the battery needs replacing. Tenants are responsible for changing this themselves. This will normally happen if the electricity is switched off within the flat. When this happens, the smoke alarm will then use the battery for power instead of the main electricity supply. If you have changed the battery or you are unsure at all, please contact Westmanor. Q. What if I have an emergency maintenance issue when the office is not open? You will not complete the maintenance form on our website. Instead, please download and complete the word document below and email it to maintenance2@westmanorpropertyservices.co.uk Thank you. IMPORTANT! BEFORE SENDING A MAINTENANCE REQUEST FORM Please ensure that if your issue is listed above that you have read and tried the suggested solutions. By sending a maintenance request form, you are confirming that you have done this. IF YOUR ISSUE IS AN EMERGENCY, you can call 0116 254 0541 to report it. Please click HERE to see a list of maintenance issues with timescales of repairs and what qualifies as an emergency. If any other maintenance issue occurs during your tenancy, then you will be required to complete the below maintenance request form. The maintenance department will then inform our contractors to attend to your property if required. Please note that there is NO CHARGE for maintenance visits unless the issue is a fault of your own.